When the Susan G. Komen Race for the Cure made a decision to sever its ties with America’s number one seller of abortions, Planned Parenthood, the media went to war. The media coverage was slanted in such a way that “mainstream” reporters like Andrea Mitchell and Lisa Myers of NBC News were openly advocating for a point of view — pressuring Komen to reverse course and give in to Planned Parenthood. Andrea Mitchell interviews Nancy Brinker. Why would the media go to war over something as seemingly insignificant as a policy change regarding funding at Komen, a private cancer charity? Part of the answer lies in the fact that, for the media, “women’s rights” take precedence over all other rights, including the rights of children. This is what “feminism” has become and this is what the Komen controversy was supposed to be about. In reality, it had nothing to do with breast cancer because the fact is that most Planned Parenthood affiliates don’t even provide mammograms. That money from Komen was used to refer women at risk of contracting the disease somewhere else. So the issue was something else as well. While there were references to Planned Parenthood being an “abortion provider,” there was no explanation of what this “service” actually “provides” — a procedure that destroys a human life. This is why the annual March for Life against abortion is mostly ignored by the major media. It is a sad fact that even some conservative women still think that Planned Parenthood is simply an organization that provides information about voluntary family planning. You saw very little in the mainstream media from pro-life people who supported Komen’s initial decision. So we made it a point to tune into the Big Three network newscasts on Friday night — hours after Nancy Brinker of Komen had caved. We wanted to see if this story would be treated in a neutral manner, or if the stories would be written from the standpoint that Brinker did the right thing — and, why did it take her so long? We did receive a shock, though it was a mild one. One of the three networks actually did a fairly nice job. NBC was first. Brian Williams handed the story off to Lisa Myers. She had a packaged piece in which she featured several pro-abortion video bites, but no sound-on-tape from any pro-life people. She provided one very short pro-life quote, as a throwaway. It was advocacy journalism, pure and simple. On ABC, Dianne Sawyer did not hand off to a field reporter and did just a brief rundown of the story. But she was giddy about “people power.” There simply was no thought that anyone in the audience might have disagreed with her viewpoint. It was a different story on CBS. Anchor Scott Pelley put the story later in his broadcast, opting for some national/international stories that he considered more important. When he handed off to Nancy Cordes, she presented a more balanced report with on-camera reaction from both sides of the issue. We suspect Pelley is influencing the CBS Evening News, and taking it down a more journalistic path. This may have to do with his journalism background in Texas. Pelley is a native Texan who started his TV career in Lubbock and then moved to the Dallas-Fort Worth market where he eventually landed at WFAA-TV. This station is well known as one of the country’s premier news operations with virtually every reporter on staff having a fine journalistic reputation. Pelley worked there for seven years. As a correspondent for 60 Minutes, he has helped move the CBS Evening News into a more serious direction. It is significant that the CBS Evening News employs investigative correspondent Sharyl Attkisson, the recipient of one of the Reed Irvine Investigative Awards at this year’s Conservative Political Action Conference. Attkisson is not afraid to offend the Obama administration by pursuing stories such as the Department of Justice cover-up of the officially-sanctioned “Fast & Furious” arms trafficking from the U.S. to the Mexican drugs cartels. Such reporting would not be tolerated at NBC News or ABC News. It seems unlikely that any network, however, would do an investigative piece on Planned Parenthood. The implication is that Planned Parenthood is a racket that victimizes young women and then exploits them for profit. Meanwhile, Keach Hagey at Politico and other so-called liberal media watchdogs are assigning credit to social media for the Komen cave. We understand that liberals by the thousands got on Facebook and Twitter to complain. But what is it they were complaining about? 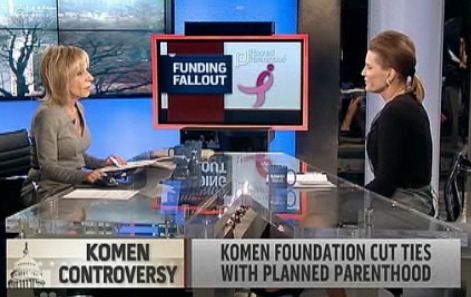 The issue for the media was that the Komen decision could have snowballed, leading to more scrutiny of what Planned Parenthood is actually doing with the money, including federal dollars, it receives. And some of that money goes into the coffers of liberal Democrats running for office this year. When Nancy Brinker dared to offend the leading organization behind the “sacrament” of abortion, the lines were drawn. That meant all the minions of the Left dropped what they were doing. It was time to go to war! The lives of women facing the risk of cancer were not the issue. They get their mammograms at other places anyway. The issue was the human lives already being lost at the Planned Parenthood clinics. This was the scandal that stood to be exposed, if Komen was not beaten down and put in its place. Lynn Woolley is a Texas-based radio talk show host. His website is www.BeLogical.com. Cliff Kincaid is director of the AIM Center for Investigative Journalism.